Whether you want to take a power nap or sleep on a long haul flight, you’ll likely have to wear a sleep mask. Issues arise though when you have eyelash extensions, as the mask could damage them. In this case, you need one of the best sleep masks for eyelash extensions. The main difference between these masks and the regular ones is their 3D design. They keep the area around your eyes free and apply no pressure to your eyelids. Not only they bring no damage to your extensions, but these masks may also keep your makeup intact. There are a few things you should consider before buying though. On the one hand, you must pick a mask that’s comfortable to wear. Breathability is one of the main features to look for, as moisture build-up can easily damage both the extensions and your eyeliner or mascara. The fit is another important thing to weigh in. Most sleep masks come with adjustable straps that usually close with Velcro. Although these are great in terms of adjustability, they could damage your hair. If that’s a concern, go for a model with an elastic strap. Design and color may also be important, but choosing between all these features can easily become confusing. That’s why we’ve put together this list of the best sleep masks for eyelash extensions. Check out our top picks below. If you want to get some sleep on a long haul flight or get some rest in the office while keeping your eyelash extensions perfect, the SMUG Contoured 3D Blackout Sleep Mask could be your best bet. Its design incorporates a unique contoured dome that doesn’t let light pass through nor wrinkles your skin. What makes this mask different than others is the super-soft material that rests gently around your eyes. The SMUG is so lightweight you won’t even realize you’re wearing it and will wake up without unsightly wrinkles or dark circles. We also like the one-size-fits-all solution proposed by the brand. There is no more guesswork as in which size to pick. Just get your sleep mask, adjust it over your eyes, and secure it comfortably with the Velcro strap. This premium level of comfort and quality will cost you though, but if you don’t mind the financial stretch, know that you can expect total darkness and accessories too. We love it that it comes with four pairs of memory foam earplugs. Sleeping in a hostile environment has never been easier, a feature that makes the SMUG perfect for traveling, but also to meditate or take a nap at the office. But the most important, it will keep your eyelash extensions intact, and it will help you sleep so good that you’ll keep wondering how did you go through for so long without it. Sleep like a baby now! No matter why you need a sleep mask; if you are shopping on a budget and still need to keep your eyelash extensions intact, the Bucky 40 Blinks may serve you well. It’s made from a soft polyester material filled with polyurethane foam. The lack of latex in the molded foam ensures suitability for those with sensitive skin, while the unisex and one-size-fits-all design makes it perfect for men, women, and kids alike. Bucky 40 Blinks can surely block out light and is adjustable so that you can find the perfect fit. The design of the strap isn’t one of the best though, and you can expect to spend some time adjusting it. It is also unrealistic to believe you’ll wake up with smooth skin. This mask does leave signs on your flesh, and people will know you’ve been taken a nap if you decide to use it during the lunch break. But if you can compromise on this and wait for a few minutes for your skin to get back to its shape after you take it off, you’ll love this sleep mask. Thanks to the wide contoured area, 40 Blinks won’t mess with your makeup nor eyelash extensions. You won’t wake up with an Uncle Fester look on your face if you decide to catch some sleep while on a flight, and it can even improve your sleep at home, by blocking the noxious light emitted by your devices. 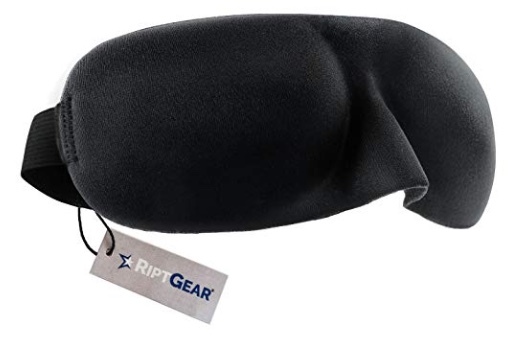 Perfect for travel, daytime naps, and meditation, the RiptGear No Pressure Sleep Mask impresses with a bunch of features. The best is the wide orbital space that makes it ideal even for those with really long eyelash extension. Lightweight and breathable, this mask is a pleasure to wear even when makeup’s on. It won’t trap sweat and won’t cause your eyeliner or mascara to smudge. Although it doesn’t block up to 100% of the light as advertised, it will still filter most of it so that you can get a restful sleep in any environment. The soft and flexible material also fits beautifully; it leaves minimal marks on your skin and hinders in no way your movement while sleeping. What we liked a little less is the adjustable strap, which can bother sometimes. It may also leak light around the nose, as the shape might not fit perfectly on all faces. But these are minor issues, and overall, it’s easy to be satisfied by the quality of this mask. The Zenesse Health’s Comfort+ sleep mask not only fits your eyelash extensions; it looks so luxurious and soft that it invites you to take a nap even when you don’t feel that tired. According to the company, this is a medical-grade sleeping mask designed to enhance your REM sleep. We can’t tell whether that medical-grade is only a fancy advertising strategy, but we have to admit this mask lives up to the expectations. Its 3D protective eye cavities create a comfortable light barrier that will let you sleep in any environment. Perfect for travel or lunchtime naps, it does an excellent job in keeping light out without impeding the skin to breathe. The plush feel of the exterior and stylish grey color also make it a perfect choice as a gift for someone suffering from insomnia, headaches, or migraines. One of the best features is the contoured nose shape, that in our opinion is superior to the molded noses. A super-soft nose baffle solves all light leaking issues so that you can rest seamlessly during the daytime. Another great feature is the micro Velcro fully adjustable strap that fits all sizes. Backed by a satisfaction guarantee, this sleep mask is also a risk-free purchase, and you can just return it if you don’t fall in love with it. OriHea by Paitree is another sleep mask for eyelash extensions users swear by. It’s similar in design with the Zenesse and does an excellent job in blocking unwanted light even when sleeping during daytime. Perfect for travel sleeping, the mask is soft and sleek. It fits easily in a bag, and it’s easy to adjust over your eyes thanks to the adjustable band between 19 and 27 inches. The low rebound memory foam and elastic polyester also ensure a snug, comfortable fit. The thick foam contour provides comfort and doesn’t hinder rapid eye movement during the REM sleep. Eyelash extensions may touch it though, depending on their length. Due to the thick padding around the eyes, there are also some chances of waking up with panda eyes if you’re wearing heavy makeup. All in all this is a comfortable sleep mask that truly does what it’s supposed to do. It filters out most light, and it’s easy to maintain by simply washing it in lukewarm water. Ideal for shift workers, travelers, and anyone else who wants to sleep or take a nap during the day, this sleep mask by SevenChakras promises to provide unrivaled comfort to all users. Its 3D contoured shape makes it perfect for eyelash extensions. Perhaps the best feature is the wide, concave space protecting the eye area. The lack of thick padding around the eyes reduces makeup smearing; as for the eyelash extensions, they will unlikely touch the mask. Due to this design, the SevenChakras could leak some light. We like that it is easy to adjust though and that it fits most sizes. The soft, adjustable elastic strap also minimizes snagging, and we like how lightweight it is. Included ear plugs will boost your experience with this product even more. If you’re in an illuminated, sleep-hostile environment, just put the mask on, tuck the plugs in your ears, and enjoy restful sleep like a baby. Furthermore, the mask also comes with a smooth satin bandana scarf, that will not only make you look cool, but that actually protects your hair from getting split ends. One of the most affordable sleep masks for eyelash extensions, the Bedtime Bliss impresses with its qualities and a whopping range of 5 stylish colors. You can ditch the classic black and opt for a livelier shade that can speak volumes of your personality and style. Not only you’ll get to choose the favorite color, but you’ll also enjoy the really wide 3D eye area designed to keep your lash extension and makeup untouched. The mask applies no pressure on the eyes and ensures a comfortable REM sleep. You’ll even have plenty of room to open your eyes, a feature most masks lack. There is a slight light leak, especially in the nose area. Thankfully though, that’s minimal and is unlikely to disturb your rest. What we don’t like is the durability of the product. While we wouldn’t expect a sleep mask to last forever, we’d like to use it for at least a full year though. Despite this slight drawback that could be easily addressed, the mask is perfect, and its price makes it a great choice if you don’t want to break the bank. It’s hard not to like this hybrid sleep mask that can be used either as a traditional one or with the included donut eyecups. Without them, the mask is perfect for a restful night sleep. If you wear eyelash extensions, makeup, or just want to take a nap during the day, the cups provide a circular extra-space for a pressure-free experience. Great at doing what it’s supposed to do, the mask has a classic design and contoured nose. Hidden nose wings block light effectively, and the flexible design ensures a comfortable fit regardless of how you like to sleep. We also like the anti-slip back gel on the adjustable headband. This feature means no tangled hair and no split ends. The modular donut eyecups are also made from a gentle material. They boast a velvet velour interior that won’t scratch or irritate sensitive skin. Furthermore, the sleep mask is compact and foldable. Fitting in the palm of your hand, it’s tiny enough to take with you anywhere. Another sleep mask for eyelash extensions that have made it to our list is this one by Pwugwes. Incorporating an eye blindfold light blocking technology, the mask boasts a 3D hump design and will never come in contact with your eyes. What makes it different than all others is the patented vent system developed to keep your skin fresh and to avoid makeup smudging. It has two ventilation holes on the sides, which not only promote the evaporation of sweat but also alleviate eye fatigue. However, it still feels a bit hotter than other masks. It’s even suitable for those with sensitive skin thanks to the antibacterial fabric. Like all masks on our list, this one is fully adjustable; its distinctive trait though is the adjustable nose area which helps block as much light as possible. Blending patented technologies in a cool design, this mask is ideal for travel and daytime naps. The last entry on our list comes from SMUG. The Active Contoured Sleep Mask shares similar traits with our top pick, but it’s more affordable. This is a contoured dome mask designed for power naps. Its purpose is to help athletes boost sporting performance, but this doesn’t mean you can’t use it as well for your naps regardless of your fitness level. The wide 3D area will help you keep your lash extension intact, and your makeup will also suffer minimal damage. Super-soft compared to other sleep masks and perfect for travel, home, and gym, this is a great alternative that will serve its purpose beautifully if you don’t mind a little light leak.